STAR TREK At 50: Enterprise - Twilight | Warped Factor - Words in the Key of Geek. After two seasons effectively wandering in the wilderness, the third season of the Star Trek prequel series Enterprise finally saw the show starting to find its feet. Centered around the threat of a Xindi super weapon that could destroy the Earth and the hunt for it in uncharted space, the third season was a different beast from what had come before. Perhaps as an example of that, the season's eighth episode Twilight presented an intriguing tale of a possible future that not only raised the stakes of the crew's hunt but also explored two of the show's characters as well. Twilight followed in the tradition of episodes such as Yesterday's Enterprise from Next Generation and The Visitor from Deep Space Nine. Opening with the destruction of Earth by the Xindi super weapon, the episode picks up a dozen years later. Over a meal and conversations afterwords, an older Jonathan Archer is informed by T'Pol of the events he doesn't remember. After encountering an anomaly in the Expanse, Archer's brain became infected by a series of parasites that stopped it from forming new long term memories that came from outside our universe. Relieved of command as a result, T'Pol became the NX-01's new captain and the mission to stop the Xindi failed. With only a few thousand humans surviving on Ceti Alpha V, Enterprise's former physician Doctor Phlox returns with a possible cure that offers not only could save Archer but humanity as well. Mike Sussman's script for Twilight is an intriguing piece of work. In forty-three minutes it does a lot, from jumping through time to showing the potential fate of Earth if Enterprise fails on its mission. Indeed it does more than any episode before it to establish the threat of the Xindi which, even though we saw their attack in the second season finale along with its aftermath, had always seemed vague up until now. From its teaser sequence to the climax, Twilight keenly proves that the Xindi are a threat to humanity which adds to the proverbial clock of doom hanging over the crew in episodes after this. Add in references to the Original Series in the form of Ceti Alpha V and what Trek fans will likely remember of that planet's fate and the result isn't pretty for humanity one way or the other. While Twilight does employ something of a reset button, the episode's pluses overcome it thanks to solid writing on the part of Sussman. Twilight does some interesting explorations of the Archer and T'Pol characters as well. Sussman's script deftly takes us on a journey through their time between the events of the present day and this possible future, and it allows for some fine performances. Scott Bakula, who described this episode at the time as "potentially the best script we've had and the best show to date" is particularly notable for playing Archer as a man out of time who struggles to comprehend the enormity of the events he's missed. Jolene Blalock's T'Pol is just as well served by Sussman's script which explores the relationship between the two and T'Pol's struggle as Enterprise's captain in his absence before becoming his caretaker, hinting at the bond between them. 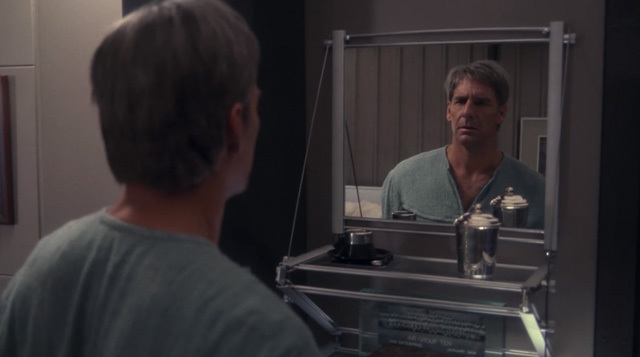 The episode's framing device is essentially a two-hander between which does not do it a disservice as it offers both Bakula and Blalock a chance to shine. 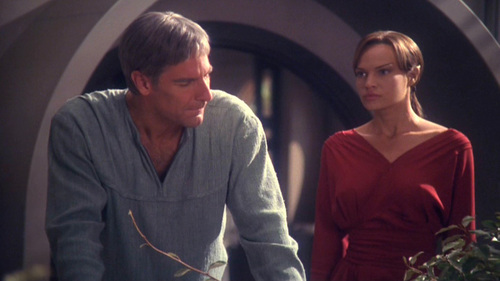 As a production, the episode also ranks as one of Enterprise's best efforts. Robert Duncan McNeill (who play Tom Paris on Voyager) does a strong job as director with a script that could have been difficult given the amount of time it covers as well as action sequences and more dramatic scenes. 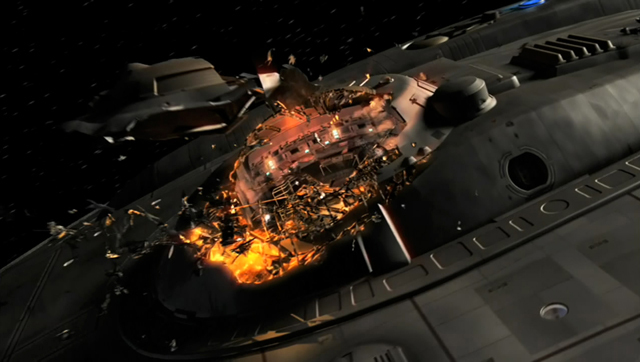 The production design of the episode admirably conveys the passage of time with wear and tear to the ship as well as Archer's dwelling on Ceti Alpha V. The episode is also one of the series special effects triumphs taking in the destruction of Earth, battle sequences and even the destruction of the Enterprise herself. The icing on the cake may well be Dennis McCarthy's score which is worthy of one of Trek's big screen adventures. Twilight then, despite its ending, stands as one of the best episodes to come out of Enterprise. From Mike Sussman's script, that finally establishes a firm threat from the Xindi while exploring the characters of Archer and T'Pol, to its production values, it stands out from the pack of Enterprise's first couple of years. It's also a turning point for Enterprise as a whole and was the first sign of what the series might be capable of. On its own it stands out as one of Star Trek best alternate timeline episodes and rightfully so.